In rodents, the olfactory bulb is located at the rostral end of the brain, where it forms part of the telencephalon. The olfactory bulb first develops in the midembryonic period as an evagination from the rostral tip of the telencephalon (Hinds, 1968b). Mitral and tufted cells, the bulbar excitatory projection neurons, are produced during the mid- to late embryonic period (Hinds, 1968a; Bayer, 1983), whereas granule cells and periglomerular cells, the bulbar local interneurons, are generated extensively during the late embryonic and early neonatal periods, with production continuing in adulthood. This adult neurogenesis of bulbar interneurons may be responsible for the high plasticity that characterizes information processing in the olfactory bulb. Animals are required to adapt to environments with ­various odors in daily life. Bulbar interneurons generated in adulthood may increase the plasticity of olfaction such that animals can choose appropriate behavioral responses in circumstances with changing odors. Because not all new neurons are integrated into preexisting circuits, adult neurogenesis is in one sense wasteful; in the olfactory bulb also, only half of new interneurons are integrated into the ­bulbar circuitry while the other half are eliminated (Petreanu and Alvarez-Buylla, 2002; Winner et al., 2002). 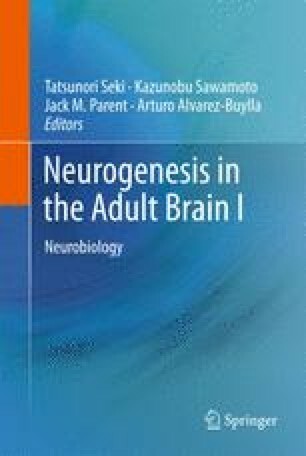 Adult neurogenesis therefore resembles embryonic development, in that neurons are initially prepared in excess, many of which are subsequently eliminated. This selection process during development is crucial to ensuring that the neuronal circuitry has been appropriately tuned to provide proper information processing (Buss et al., 2006). A similar selection process occurs in the olfactory bulb of adult mammals, where it allows the bulbar circuit to select the appropriate type and ­number of neurons from among excess pools of new neurons in accordance with the ­particular requirements of the odor situation in which the animal finds itself. The mechanism by which adult-born neurons are selected, in other words, their fate of survival or death, is therefore key to understanding how adult-born bulbar interneurons contribute to the functional plasticity of the bulbar circuitry. In this section, we first address how the survival or death of adult-born neurons is controlled. We then compare the development and survival of adult- and neonate-born neurons to investigate how the integrity of the bulbar circuit is maintained and remodeled by adult-born neurons. Although two major types of interneurons are found, periglomerular cells and granule cells, the major population of adult-born interneurons are granule cells. This chapter therefore focuses mainly on the properties of granule cells.